A Masters in Global Englishes unlocks the mysteries behind the English language and enables you to both teach and study it to a higher level. This programme will address key issues in Global Englishes including; English as a Lingua Franca, World Englishes, the role of English in education globally, English language policy and practice, intercultural communication and intercultural pragmatics. The programme will be taught by members of staff from the world leading research Centre for Global Englishes. Study an MA in Global Englishes at the University of Southampton and gain an insight into the immense impact that the English language has had on a global scale. It is a fundamental component of business transactions and diplomatic dealings throughout the world. Studying this MA degree will present the importance of English as a world language and the influence it has had on other cultures and the varieties of Englishes that are spoken internationally. Study the pragmatics of English in global contexts and Guided by leading experts in this field, this masters degree can help move you towards a career in teaching, politics or publishing. It has been estimated (conservatively) that there over 2 billion speakers of English as a second language or lingua franca worldwide today. This gives rise to questions about what is ‘correct’ English, who ‘owns’ English and how it should be used and taught. The programme will be taught by members of staff from the world leading research Centre for Global Englishes. This postgraduate programme is normally studied over one year full-time (48 weeks). It comprises eight Masters level study units (four Core 7.5 ECTS (15 CATS) credit modules, a 30 ECTS (60 CATS) credit core dissertation and four Option modules), plus additional visiting speaker seminars and other extension activities, taught over two semesters (30 weeks). The independent research dissertation is completed over a further period of 18 weeks. Part time students are also accepted, and complete the taught programme over 4 semesters, followed by the dissertation. Academic entry requirements: First or upper second class honours degree, or an equivalent standard in other qualifications approved by the University in English, modern languages, or a cognate discipline. 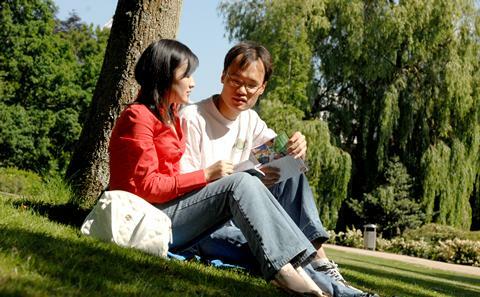 English language entry requirements: IELTS 6.5 overall, with minimum of 6.0 in all components, or an equivalent standard in other qualifications approved by the University. Each study unit has a value of 7.5 ECTS, making 60 ECTS (120 CATS) altogether for the taught component. The dissertation has a value of 30 ECTS (60 CATS) credit points, giving the degree an overall credit rating of 90 ECTS (180 CATS) points. Printing and copying Where possible, coursework such as essays; projects; dissertations is likely to be submitted on line. However, there are some items where it is not possible to submit on line and students will be asked to provide a printed copy. The University printing costs are currently: A4 - 5p per side (black and white) or 25p per side (colour) A3 - 10p per side (black and white) or 50p per side (colour) Please Note: Paper sizes not recognised by the printing devices will prompt you to select the size and then charge a minimum of 50p per black and white copy and a maximum of £1 per colour copy. You can pay for your printing by using the money loaders or by using print copy payment service by going to https://www.southampton.ac.uk/isolutions/students/printing-for-students.page Please remember that we are unable to refund any credit that has not been used by the end of your course, so please consider this when topping up your printing/copy account. https://www.southampton.ac.uk/printcentre/index.page? also offers a printing and copying service as well as a dissertation/binding service. Current printing and copying costs can be found at https://www.southampton.ac.uk/printcentre/copyrooms/service.pageThey also provide a large format printing service, e.g. Academic posters. Details of current costs can be found at https://www.southampton.ac.uk/printcentre/exhibition/academicposters.page? Career destinations for students on this programme will be as researchers of Global Englishes, applied linguistics teachers, English language teachers in state and private institutions internationally, or in Education Ministries or the publishing industry. The programme will consist of 8 x 15 CATS credit modules plus the dissertation (60 CATS credits). These will be delivered through lectures, seminars, small scale research projects and independent study. There will be ongoing assessment and feedback via lecture and seminar activities. Formal assessment will be by written assignments, oral presentations and the dissertation.